I love dishes that are packed with flavours, I love them even more when the recipe can be quickly assembled after a long day at work. This tasty chicken recipe came courtesy of Easy Cook magazine and was ready in just 25 minutes. In a large frying pan, dry-fry the bacon over a medium heat for 3 minutes, until the fat is released and the bacon is golden. Transfer the bacon to a small bowl, leaving the fat in the pan. Add the chicken and brown for a few minutes on each side. Push the chicken to one side of the pan and tip in the garlic and spring onions, cooking for about 30 seconds. Pour in the chicken stock, return the bacon to the pan, cover and simmer for 15 minutes. To finish the dish, increase the heat under the pan before tipping the peas and lettuce into the sauce and cook for 4 minutes, until the peas are tender and the lettuce has wilted slightly. 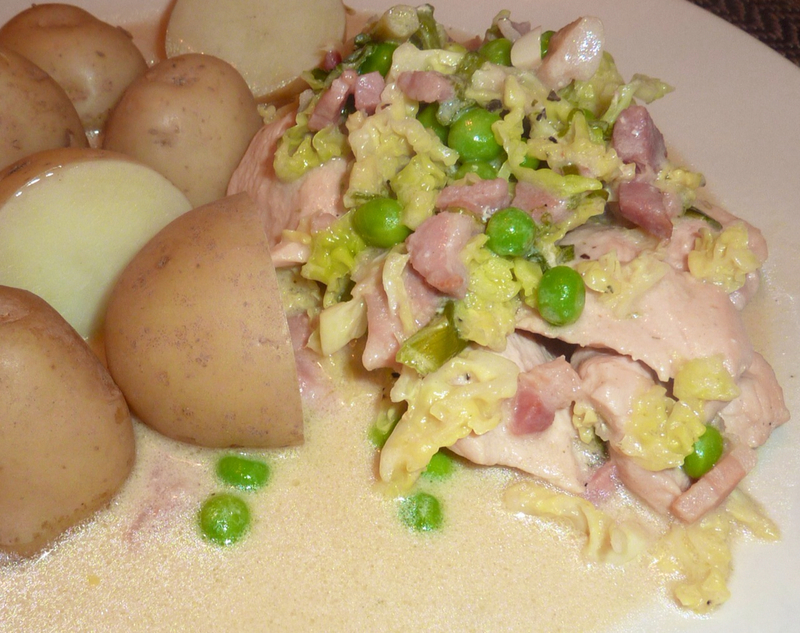 Check that the chicken is cooked through then stir in the crème fraîche before serving. 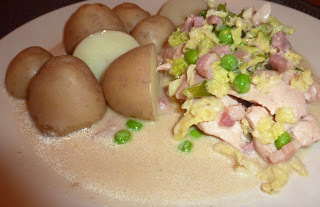 Tonight I served the creamy chicken with boiled new potatoes but I think it would work equally well with boiled rice. In fact, I think that this dish could be easily altered and tweaked to suit your own taste. Wholegrain mustard, or smoked paprika would add a new dimension to the creamy sauce, whilst adding chopped leeks or sliced mushroom would also work incredibly well with the bacon and chicken. Give it a go and look forward to hearing what little twists make this dish work best for you!